Integration with third-party applications allows them to communicate orders easily with their 3PL system. Integration with marketing platforms centralized their lead management system. Byju’s was born out of the need for high-quality and a more accessible way of learning. Based in India, Byju’s offers original content, watch-and-learn videos, rich animations and interactive simulations through its app which makes learning a lot more fun and easy to understand. Byju’s started out with classroom teaching, however, Raveendran was keen to formulate technology oriented learning methodology to make learning visual and contextual, as a result it emerged as an educational technology company. The learning app is now being used by 1.6 lakh paid subscribers. Within no time Byju’s increased its revenue by 400%. The startup, whose average annual subscription ticket size is Rs 10,000, generated a revenue of Rs 4 crore in its first year, according to Economic Times. “We’ve created students who are addicted to learning, and therein lies the secret to our success,” says Raveendran. When asked what made Byju’s look for a custom based back-end solution? As they were growing, Byju’s were not keen to invest in a Traditional ERP solution which is often difficult to customize and does not scale with growing volume. While they were searching for a back-end solution, they came across Orderhive. Considering Orderhive offers customized solution under “Orderhive Enterprise”, taking up the challenge of helping Byju’s streamline their operations didn’t seem like a far-fetched reality. Through detailed analysis, Orderhive experts were able to understand the outcomes the company was trying to achieve by using a customized solution. 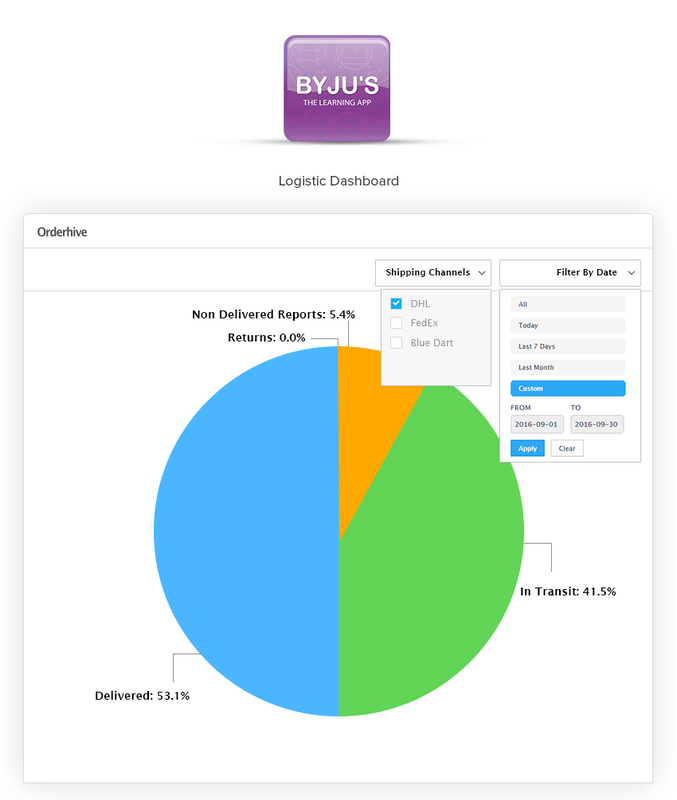 Byju’s needed features to be developed as per their order management workflow. With the level of growth, it was evident that Byju’s needed more manpower to handle its daily operations. Currently, Byju’s has 1000+ employees actively working under its gable. Byju’s has appointed 200+ sales representatives to handle customer inquiries and demonstrate the products. However, there was no real-time tracking of sales activity conducted by these salespersons. The Sales managers were not able to track the daily activities conducted by their respective sales reps. As a result, they didn’t have detailed insights into the sales conversions which directly impacts the revenue graph. The Logistic team was spending more time in delivering the orders as there was no system available by which they could keep a track of the shipped, delivered & unfulfilled orders. The finance department was devoid of information/references on the payments made. The support department was facing hassles in resolving customer queries due to lack of updated and organized information about customer orders & issues. The entire process between lead generation & lead fulfillment wasn’t streamlined. As the organization structure got more refined, employees across different departments needed access to a standardized format of information to keep the fulfillment process aligned. However, Byju’s also wanted to restrict the access to information by the user’s role. Going by this requirement, Orderhive Enterprise designed the concept of role-based dashboards. Given the level of trust Byju’s has exhibited on Orderhive, our team was more than thrilled to pace up with Byju’s scaling business requirements and further automate its complex processes, giving more room to focus on their core business activity. Orderhive Enterprise provided a centralized repository by which the sales manager can keep a track on their respective sales person’s daily activities and check on the target achieved. Orderhive Enterprise allows the Finance team of Byju’s to have full access to a detailed payment report from the system. To know whether the order is PAID or UNPAID. To identify the mode of Payment opted by the customer. Check the discounted price offered to the customer before confirming the order. Seek clarification from the Sales team regarding any payment queries. Shipping Status & Workflow – From a single Interface, the logistic team can pick, ship, deliver and track orders. Every order has a shipping status indicated by a specific icon. The icons are automatically updated according to the current status of the order. The logistics team can manage & track the entire process. 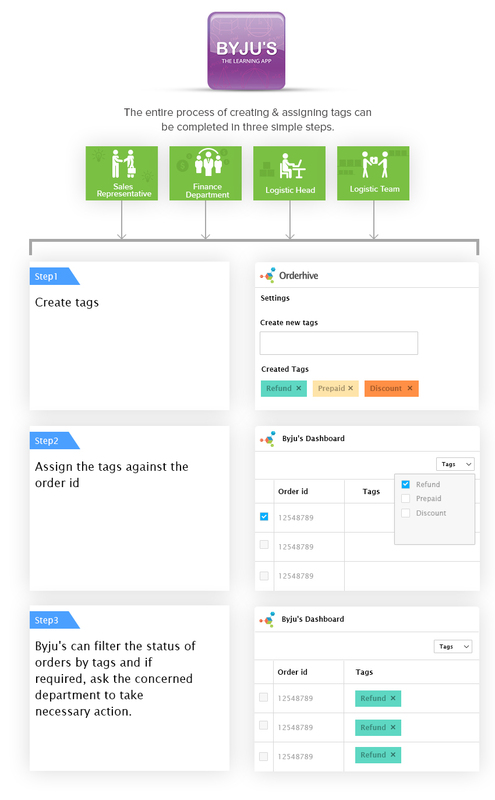 The fundamental concept of a role-based dashboard is that it shows tasks & privileges specific to the users and help them to take appropriate actions. Plus, Byju’s can also restrict the content of information specific to their individual role. LeadSquared, a lead management system seamlessly captures leads from different marketing sources and brings it in a single dashboard. These leads are further segmented on the basis of maturity level. Once a lead goes into confirmation stage, Orderhive retrieves information related to the confirmed orders and reflects it on its dashboard, helping the teams to take appropriate action. FreshDesk is a query handling tool. Our solution enables users across all the departments to raise tickets when an issue needs immediate attention. These tickets get further synced into freshdesk, which helps the team to resolve the issue quickly. IVR Technology is a technology which accepts a combination of voice telephonic input and touch-tone keypad selection and provides appropriate responses in the form of voice, fax, callback, e-mail and other media form. The IVR System retrieves information about the order status from Orderhive Enterprise and converts it into an automated telephonic message, so whenever a customer dialed in the IVR system to access the status of the placed order, the system generates the updated & correct message. Generally, with large enterprises like Byju’s, inefficient order processing becomes a bottleneck. Tracking order status throughout the fulfillment process becomes a challenge, even more, when the team across the departments finds it difficult to define the status of the order which falls into a unique scenario. 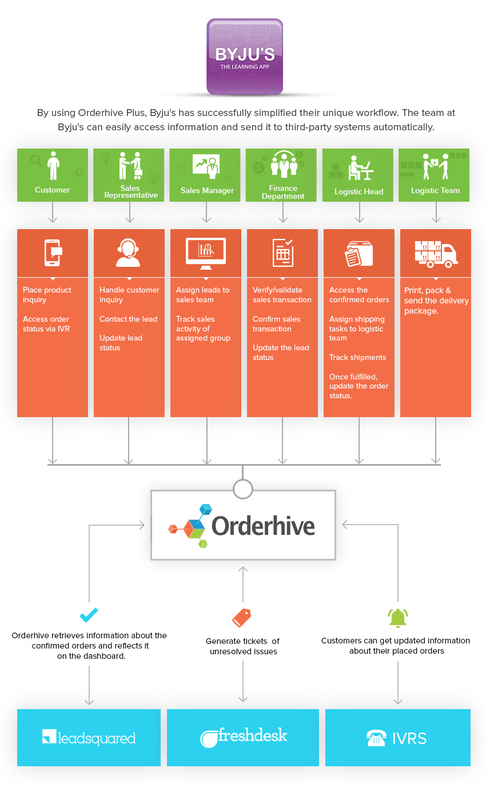 The below infographic shows how Orderhive Enterprise streamlined order management by designing a feature where the teams across various departments can create their own custom order status called as “Tags” and assign it to the order id. Orderhive designed customized dashboard for the logistic team where they can filter the orders by dates & shipping providers and have access to full analytical report show in the below infographic. Apart from customization, Orderhive Enterprise’s capabilities include scalability, advanced security, fully-managed private server, unparalleled support, and training. After deployment, the company now has a working ecosystem of centralized back-end solution, an organized communication tool, shipping integrations (Blue Dart, Pigen, FedEx) to fulfill orders at a bullet speed, all within Orderhive Enterprise.